My Mom gave me some fresh rhubarb from her garden, so I searched for a vegan rhubarb muffin on the internet and found this one on The Venice Vegan. They're delicious! I didn't have any "Egg Replacer" (Ener-G), so I used banana & sunflower oil, and then added some extra soy milk until it came out the right consistency. 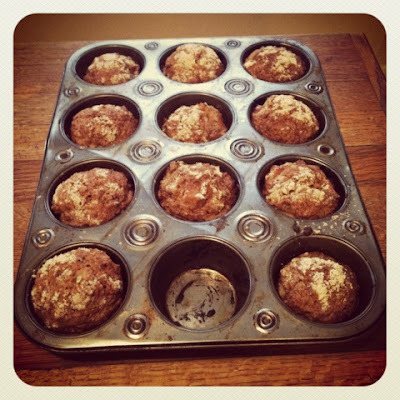 Although it only made 11 muffins, they're well worth it... the ginger & cinnamon give them a hint of spice and make them extra special. Preheat oven to 350. Mix all dry ingredients thoroughly then incorporate wet into dry. Combine streusel ingredients and mix with fingers until combined. 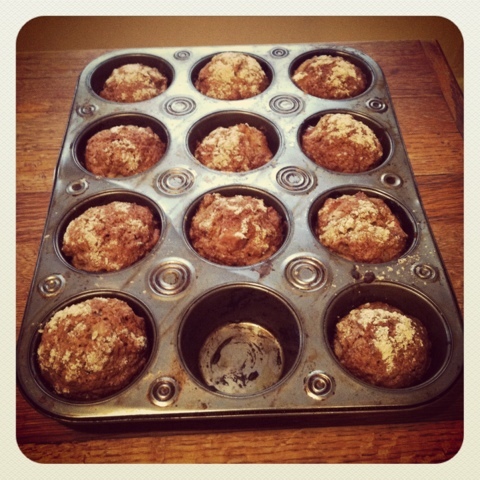 Divide into 12 lined muffins, and top with streusel mixture. Bake for 35 minutes.